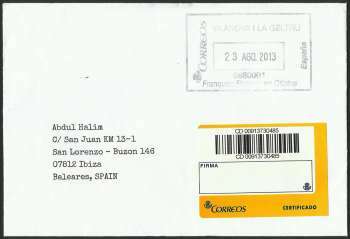 Philatelic cover sent from Vilanova to Ibiza. 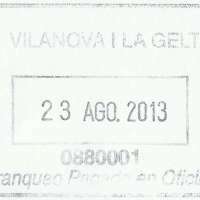 It was sent on 23 August 2013 and arrived at San Lorenzo's post office on 29 August 2013. It was then collected on 3 September 2013. In 2013, inland (domestic) registered mail cost €2.72 - which can be paid in full using stamp or by handing cash and the clerk will handstamp PAID postmark (without actual stamp required). By receiving office, asked during mail collection. It seems the year was wrong. Registered mail describes letters, packets or other postal documents considered valuable and in need of a chain of custody that provides more control than regular mail. The posted item has its details recorded in a register to enable its location to be tracked, sometimes with added insurance to cover loss. Traditionally, registered mail was a manual process which gave rise to a great variety of distinctive handstamps and registration labels. 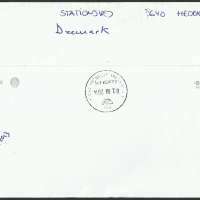 Many countries have issued special postal stationery for registered mail. Earlier similar services were known as Money Letters. 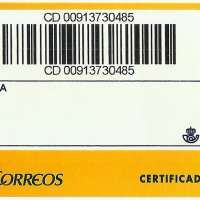 Today, however, the registration process is largely computerized with barcoderegistration labels replacing the traditional analog labels having only a printed serial number. Generally, the item is pre-paid with the normal postage rate and an additional charge known as a registration fee. Upon payment of this fee the sender is given a receipt, and (usually) a unique numbered registration label is affixed to the letter. As the letter travels from post office to post office and through any sorting office, it has to be signed for on a ledger. This process is completed when the letter is delivered and the receiver signs for the item. With computerization and barcode technology, much of the logging once done manually has become simpler and leads to greater options for the sender and receiver alike to access the status of their shipment via the internet. Many postal authorities provide tracing information for registered items on their website. In most countries, the use of registered mail require labels with a 13-digit reference number and corresponding barcode. 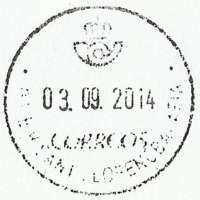 The first two letters indicate registration (usually "RR") while the last 2 letters usually represent the country where the registered item was posted. E.g., RR913282511SG indicating Singapore, RB5584847749CN indicating China or RR123456785KR indicating Korea.